Quick quiz: Who is the most famous fugitive in the Bible? Jonah is famous for being the prophet who ran from God, but ran into God in the depths of the ocean! He discovered there are no hiding places from God. • Geography. Jonah thought he could hide from God in a foreign land. • Religious prejudice. Jonah thought the pagan Assyrians didn’t deserve God’s compassion. • Self-pity. Jonah thought God was being unreasonable, so he retreated into feeling sorry for himself. • Stubbornness. Jonah thought he could just say “No” to God. See how easy it is to try to hide from God? Of course, hiding from Him is impossible, but sometimes building hideouts and hideaways is something we do anyway. Then God comes knocking, just as He did with Jonah, to ask us why we’re hiding from Him. We don’t usually hear of people quitting their jobs and moving to a foreign country to hide from God as Jonah tried to do. But that doesn’t mean we don’t try to build modern kinds of hideouts and hideaways. Think about the following examples—have you built any of these in your life? • Work/Career/Advancement. Sometimes we know God wants us to do something for Him but we hide out in our jobs or careers. And when He comes looking for us we say, “But Lord, I’m working to be able to provide for my family . . . oh, yes, and to be able to give more to Your work.” Or, “But, Lord, you gave me talents. Don’t You want me to use them?” Or, “But, Lord, I just need the next five to ten years to get established in my career. Then I can start cutting back on work.” Working hard is commendable. But since all our work is for the Lord (Colossians 3:23), He may have a different assignment for us in His kingdom. Just like Jonah, we have to be prepared to do what He wants, not what we want. • Family. This is a subtle one because everybody knows that family is important to God. We don’t know if Jonah had a wife and children, but what if he had said to God, “Sorry, Lord. I can’t go preach to the Assyrians because I have to be at my son’s soccer game, go to my daughter’s recital, help my wife with her community project, and take the family on our annual summer vacation.” Can you imagine? Yes, you probably can. Who hasn’t allowed family to become the top priority in life and used the Bible to justify it? We are in complete control of our family’s schedules, and if family leaves little time for God . . . whose fault is that? It’s a sad day when we’re so consumed with family that we can’t hear the Lord knocking on our own door (Revelation 3:20). • Leisure. Here’s another hideout that’s easy to build; another one that’s easy to justify “in the name of the Lord.” “The Lord doesn’t want us to be so stressed out,” we say. “It’s important to carve out time for recreation and entertainment.” Well, yes it is. The problem is, we live in a society for which entertainment is a way of life—the end itself instead of a means to an end. Jesus and His disciples drew away from the crowds on occasion, but that was so they could be refreshed for further ministry. Hiding from God in leisure is a sign we have let the world distract us from the work of the Lord (1 Corinthians 15:58). • Ministry. This is the most camouflaged hideout of them all. What better way to avoid doing something the Lord has called us to do than by doing something He hasn’t called us to do! “But, Lord, can’t You see that I’m up to my neck in six-year-old boys in my Sunday school class? I couldn’t possibly take the Gospel to the homeless in the inner city.” When we hide from the Lord in ministry, we are missing our most important ministry: to the Lord (Luke 10:41). Are you running from the Lord and hiding out in any of these places—or other places only you (and the Lord) know about? Don’t forget: There are no hideouts or hideaways God does not know about. You will eventually come face-to-face with Him at a time and in a place you least expect. Be a follower, not a fugitive. Run to the Lord, not away from the Lord. Hide in the Lord, not from the Lord. When the Lord sees you next, may He see your face, not your back. Shadow Mountain Community Church in El Cajon, California. 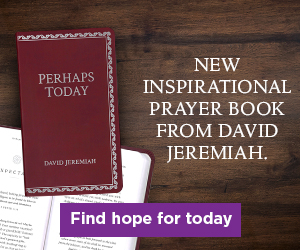 For more information on Turning Point, go to www.DavidJeremiah.org.